The block for week 6 of the Long Time Gone sew-along is Plus a Star. The cutting and piecing for this block is very simple, but deciding on color placement was tricky. I am sure that there are many others like me that cut out quite a few extra squares or rectangles that were not used in the final block. I like the contrast between the different plus signs and how the cream background lightens up the whole block. 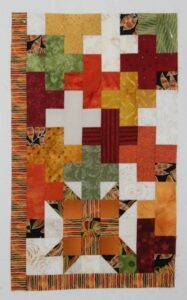 Jen Kingwell’s design uses checkerboards to fit all the different sized blocks together in the quilt top. I have been piecing them as my leader/ender while sewing on the blocks and attaching them where possible. Next week I will be sewing Churn Dash blocks and be able to attach a few of the blocks together. 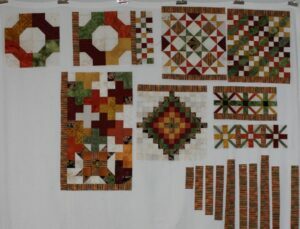 It will be so quick and easy to have a finish quilt top with just a little bit of time spent adding the sashing and cornerstones to the blocks. Today the plan is to add sashing to the burnt orange Lincoln block, then back to Buried Treasure.